Dossier – Stephenson, Neal. The Diamond Age, Or, a Young Lady's Illustrated Primer (Bantam, 1995). Summary – A girl gets a remarkable(/ly) immersive book that lifts her out of one trajectory and into greatness, while a nanotech-engineer, having invented said book, finds himself in Hot Water and almost destroys the foundations of society. High-tech – While not so temporally distant from the present, we're further away than in Snow Crash, with the invention of matter compilers (nanotech that, nonetheless, already exists in primitive form today: 3D printing!) a truly revolutionary development since now anyone can just ask the magic box for, like, some tasteless food, or a mattress, or a knife with a monofilament blade and presto! The implications for matter compiling are almost endless, and threaten to render the world Stephenson crafted almost unrecognizably different from our own, however. There are cyberpunk-esque skull guns, "hoplite" armor and bullet-proof dusters, as well as nanosites (really really small artificial parasites) that can invade the human body and do a) nothing much, b) good stuff, or c) make you explode. Dark times – Run afoul of the law, like Nell's idiot father? Enjoy your last minutes of life, as cookie-cutter nanosites invade your body and prepare to detonate from within...ouch. This is a world that is based upon hierarchy and order, and you had better hope to be born into a good tribe/phyle because if not, you're in deep doo-doo. It's also a world threatened by a massive awakening of xenophobic sentiment in what was once the nation-state of China. The 'Fists' (as in 'Fists of Righteous Harmony', i.e. the Boxers) have risen again, and are determined to win back their country and drive out/murder all foreigners. Scary (but also patently ridiculous, as is the mysterious Seed technology with which they intend to remake the world). Legacy – Not as well received as Snow Crash, this intricate and generally well-crafted book nonetheless reached millions, and certain aspects of the book continue to resonate today, especially the Book itself, the Primer and its promise of emancipation through education. In retrospect – Because the future it depicts is even more outlandish than that we see in Snow Crash, and because The Diamond Age combines in one package the same key stylistic/pacing weakness (a shocking lack of falling action after the climax, which in this case occurs literally on the last page!) 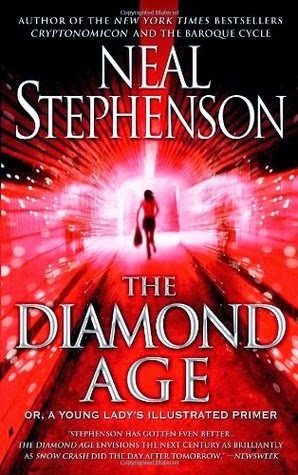 that mars Snow Crash with the astonishingly excessive detail in world-building and exposition plaguing his post Diamond Age work (Baroque Cycle in particular), this book sits at a weird transitional point in Stephenson's career. The mid-90s were a giddy-with-hope-but-also-terrified kind of time, with the collapse of the USSR and so forth, but the more apocalyptic aspects of Stephenson's speculations on our (societies') future seem fairly outlandish to us today. The rapid progress in 3D printing notwithstanding, in the twenty years since the book was first published, the nation-state has yet to shuffle off its mortal coil, and shows no signs at all of doing so; even if some of the nanotechnological breakthroughs as must have occurred in Nell's world happened right away, one doubts whether much would actually change in the nature of society formation. Stephenson's vision of the future rests on several underlying premises/ethical positions, some plausible enough, some pretty goofy. In the former category there is the transformative power of education; in the latter, the idea that not only fashion but ethics are cyclical; sorry Neal, a return to Victorian morals is not in the cards, and would carry none of the benefits you whimsically ascribe to such morals anyway. And as the scattered nature of this review/re-visitation should make clear, the book is so complicated (I would argue, needlessly so) that it is very difficult to sum up with any pith, or retain in one's mind for any length of time. The only thing I remember from my first reading, all those years ago, was that there was a long section on Turing machines that was impossible for me to visualize and boring, but mostly it was about a girl who stumbled on an awesome, super-expensive book that sounded fun—a lot more fun than The Diamond Age, in fact, with its interminable discussions of Turing machines and occasionally clumsy exposition (the worst is between Miranda and Carl, who have several conversations (pp. 270-271, 284, etc.) that explain the fundamental workings of some of the key technologies in the book but might as well have a "Forced Exposition!" banner slapped on them, so ill-fitting are they in terms of narrative flow). On the other hand, Stephenson did an absolutely masterful job of crafting morally complex characters, with no clear antagonist (even the shadowy Mr. X is obviously not a "bad guy" inasmuch as it was he, almost single-handedly, who saved the 330k girls from their fates) and plenty of hard choices for the protagonists as well. Zhaoyun, while a devoted fan of Neal Stephenson in general, is not afraid to say to Stephenson, "Hey, man, think of a less anticlimactic/abrupt way of ending your books, will you? You're killing me, here!". and has been issuing this and other gauntlet-in-your-face challenges at Nerds of a Feather since 2013.